“Huh,” I say in response, thinking how warm I am. 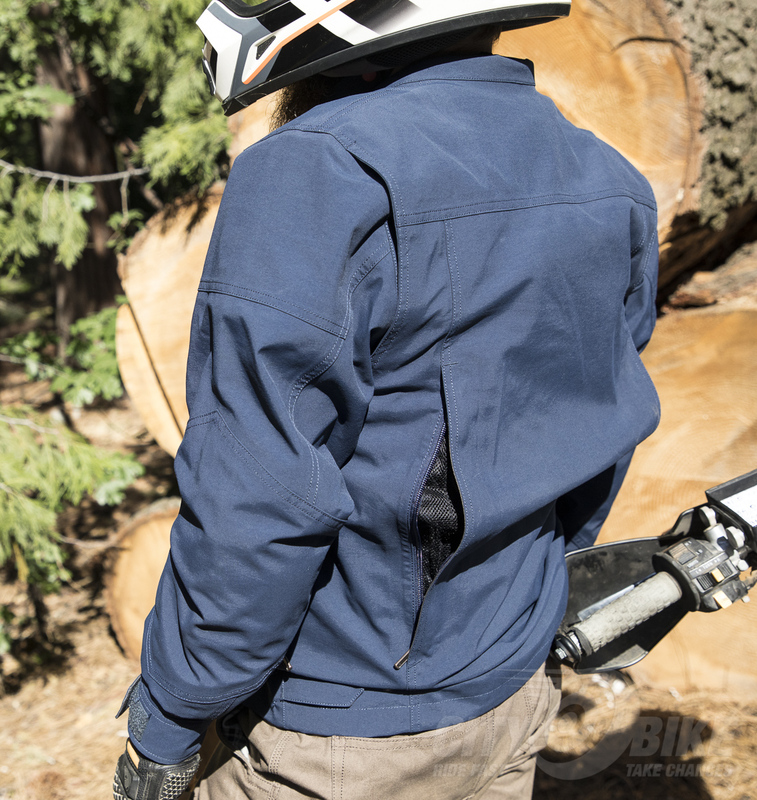 Inside the Klim Revener jacket, I have a wind-blocking mid layer and a t-shirt. “Huh.” My nose is a little cold, I guess. Months later I’m riding Bungee Brent’s Backroad Bash in the Sierras and the temperatures are in the high 90s and low triple digits. The first day I wear a motocross setup: padded shirt, knee pads, breathable jersey and riding pants. Now, here’s the thing: as soon as you stop riding and start walking about in 98-degree-weather, you sweat, no matter what you’re wearing—heck, you could be nekkid and it would yield the same result. As long as we’re moving it’s fine—except for one highway segment that feels for all the world like sitting in front of a giant hairdryer. But every time we stop for more than a few minutes I’m peeling off my jersey and padded shirt. Vanity’s little more than a passing thought. Making the coat even easier to use, its pockets and main flap are held in place with magnets. Magnets! How do they work? Miracles. But seriously, using this coat made me a little mad in hindsight. It feels like human developments should really have gone: 1) The wheel 2) Sliced bread 3) Magnets in clothing 4) Free Wifi 5) Universal Healthcare. Seriously, magnet clasps are the business! (Unless you have a pacemaker.) You put the coat on, zip it shut and then slide your hand down the flap as though you were merely thinking about snapping the buttons, and the main work is done. A conventional snap at the top and another at the bottom hold it securely shut in case of wind or unanticipated vehicular separation. Besides being Gore-Tex-gauren-frickin-teed to keep you dry, it has croissant pockets—you know, pockets on the inside bottom of the jacket large enough to hold a morning pastry on your way to work. You could call them glove pockets or beanie pockets if you want. Either way, there’s a big croissant pocket on each side—super utilitarian. If you can’t get it to fit in there (to-go boxes, apples, tennis balls, coffee mugs, magazines, small packages—note: you probably shouldn’t carry any of these things in your pockets), it probably needs to be strapped to the bike or put in luggage in case of a crash. Speaking of which: I was wearing the Revener when I had occasion to get off my motorcycle after encountering a sports car mirror whilst lane splitting. I landed underneath the bumper of a compact car, striking my back on its bumper as I was stuffed between the car and the pavement—very happy to have the D3o back protector. The coat only developed minor holes in two places: on a pocket that held some nuts and bolts (always wondered how that would play out), and on the right elbow. The elbow hull breach is thought to have been caused by the windshield of the bike, since the coat is fine everywhere else, not even really showing signs of wear. So what now? The Klim Protection Guarantee, under certain conditions (including presence of a police report) may replace your crashed gear for free. I’ll be repairing the coat myself though, possibly beefing it up with some super fabric. 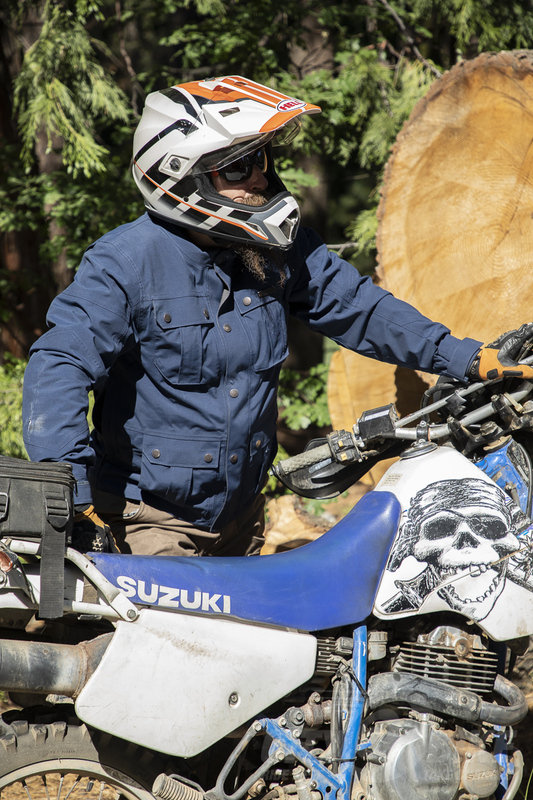 Probably not what Klim had in mind when they agreed to let us play with a coat, but it is a cool reminder that this is 2017 and, if you can imagine it, you can make it happen. There’s a well-built, padded, classic-looking, rainproof motorcycling jacket with croissant pockets out on the market. And if you crash it, you can throw a couple hundred bucks at it and customize it, enhance it. Or the company could replace it for you free of charge. That’s the world we’re living in. And that’s pretty cool. This modern world, built on our progress as a species, is leading to stronger, lighter protective materials that are fueling a rise in casual-looking riding gear. The Revener is a fine example of safety attire that does not have to be removed once at work or while socializing. It looks like a classic jacket, like anything worn by a businessman, a logger, a butcher, a baker, the candlestick maker. Last winter, I’d been using an adventure jacket with a rain liner. It had served me well before and did again for the first few days of rain. 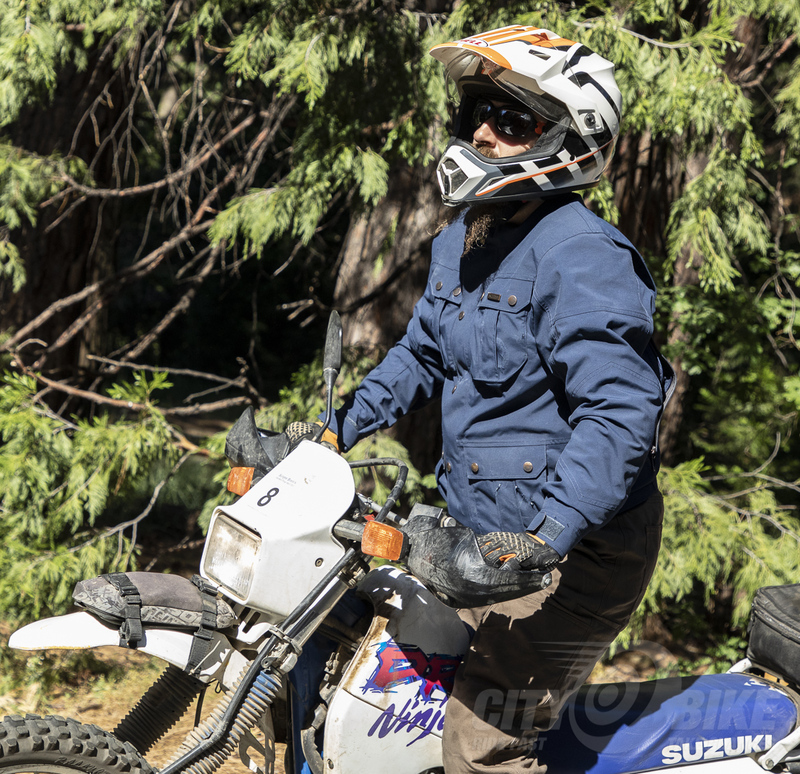 But as the deluge continued, it started to smell a little funky, having never really dried out… So I opted to ride in a padded, Kevlar-lined flannel and an old snowboarding jacket. It was simply more wearable after arriving. To solve this awkward gap in gear I was experiencing, and since I’m feeling pretty embedded in this whole motorcycling lifestyle thing, I considered the top tier options out there. But I didn’t want an over-suit that I’d have to remove and store while off the bike. I wanted something I could take off and hang on the back of a chair. And I didn’t want anything heavily branded (which takes a lot of all-weather gear off the table). So that only left a few options. The Revener hit all my requirements, saying “Klim” only on a small brass plate above a chest pocket. And it offered a few features I hadn’t imagined: croissant pockets and magnetic closures! 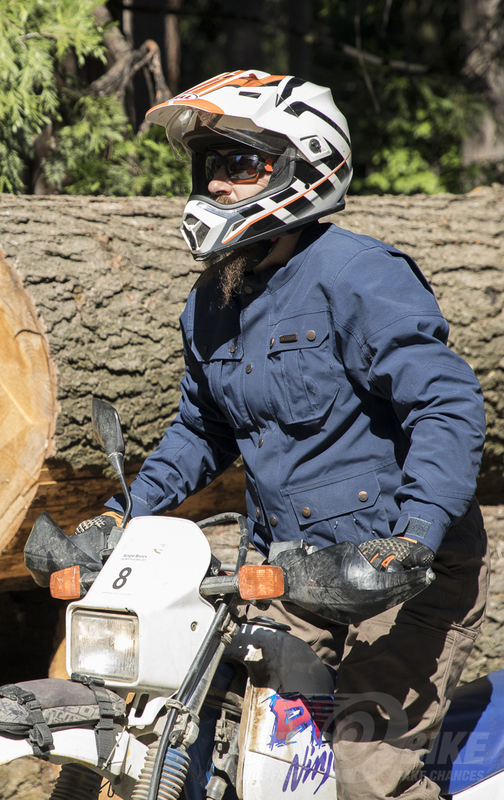 Paired with the Klim Torrent overpants, this coat has made an all-weather jacket sensible for my day-to-day and a go-to for longer touring and even dual-sport riding. I’m looking forward to many a good ride in it. And many a good croissant. $529, small to 2X, $549 for 3X. Available in blue or brown. Learn more at Klim.com.